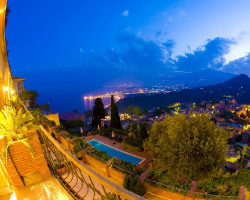 If you are visiting Taormina to see a show at the world famous Teatro Greco, possibly the most spectacular venue on earth, then you will want to stay somewhere that has a music pedigree. The acclaimed British rock band 'Simple Minds' have sold over 60 million records worldwide and played concerts at amazing locations all over the planet, but when lead singer Jim Kerr visited Taormina he fell in love. In fact he fell in love with not only the Teatro Greco but with Taormina and the Sicilian welcome that he received! Such was his love for Taormina that he built the beautiful Hotel Villa Angela on Via Leonardo Da Vinci. 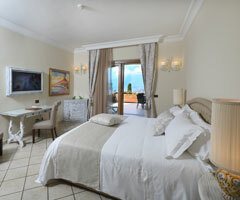 The hotel is perfectly located to enjoy the breathtaking scenery of Mount Etna and the sparkling Ionian Sea. With direct access to the historic centre, it is close enough to allow exploration of all Taormina has to offer, including Teatro Greco itself and the upmarket shopping area peppered with world class Sicilian restaurants. Possibly the most stylish and understated of all hotels in Taormina, Hotel Villa Angela has become known for unsurpassed service and quality and, although a medium-sized hotel, it manages to retain the intimate and friendly feel of a boutique hotel while allowing the privacy you would expect from a much larger establishment. Oh, and you may just find yourself sharing breakfast with a few famous faces! 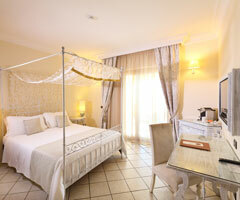 Visit HotelVillaAngela.com for special rates and book now! The Ancient theatre of Taormina ('Teatro antico di Taormina' in italian language, the 'teatro greco', or 'Greek theatre') is an ancient Greek theatre, in Taormina, southern Italy, built early in the seventh century BC. This site has been built out of love for the truly unique venue that is Teatro Greco in Taormina. Whilst every care has been taken to make sure that the info contained is accurate, there may be errors and we urge visitors to double check the info with event organisers before incurring any cost. Copyright (c) Existing rights holders & TeatroGrecoTaormina.com. All rights reserved.